DNS stands for Domain Name System, which is the largest digital database in the world. It contains information about every domain name on the Internet, ie. where the website files are stored, which mail server handles its emails, etc. Each piece of these information is called a DNS record and together they make up the domain name’s DNS zone file. When someone types in a domain name (ie. www.Doteasy.com) in their web browser, it sends a request to the DNS server to find out which server hosts the web files for that domain. The request is then forwarded to that web server so the web files can be served. DNS uses records in a domain’s zone file to determine which server(s) is responsible for the domain’s website, email, etc. There are many types of DNS zone files and each of the records provides information about a specific entity. CNAME – stands for “canonical name” and it used to specify that a domain name is an alias for another domain name. A – stands for “address” and it indicates the actual IP address of the domain name. MX – stands for “mail exchange” and it specifies the mail servers that are used for the domain name. TXT – stands for “text” and it is often used by administrators to insert any arbitrary text data or notes about the domain name. For example, it is often used to define SPF settings. SRV – stands for “service” and it maps a domain to another using a specific destination port. For example, it is often used to define a TCP service on which the domain operates. AAAA – stands for “IP version 6 address” and it specifies the IPv6 address of the domain name. It works the same way as the A record. NS – stands for “nameserver” and it specifies the authoritative name server, or the server that holds the domain’s zone file. For example, dns1.doteasy.com and dns2.doteasy.com are Doteasy nameservers. 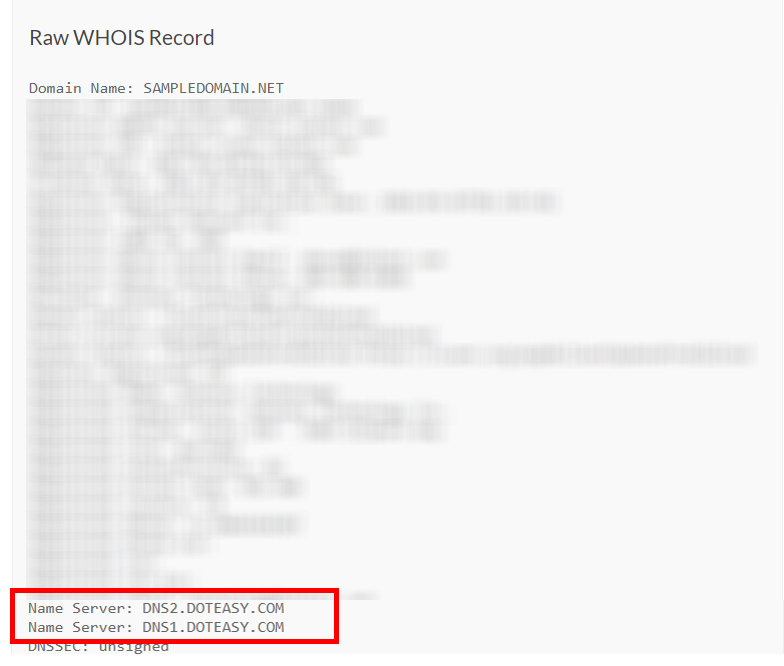 Let’s take a look at this WHOIS record (it would be the same case if you have listed Doteasy name servers on your domain). When you sign up for a Doteasy hosting account, you are assigned a web server to store your web files and a mail server to manage your email addresses and messages. In order for website visitors and email senders to know where to find your domain name, you need to somehow attach the Doteasy web and mail server information to your domain name. Since each server on the Internet has an IP address, the easiest way is to create a record that maps each particular service to the responsible server IP. For example, if your domain is using Doteasy’s mail server, an MX record pointing to Doteasy’s mail server IP address will be created for your domain. All these individual records are compiled into a DNS zone file and the zone file is kept on a Doteasy nameserver. This is why when you are using Doteasy’s hosting service, you are asked to change your domain name server to Doteasy’s nameserver. When someone sends you an email, their sending mail server sends a request to the DNS server to find out which mail server is accepting emails for your domain name. By listing having a Doteasy nameserver on your domain you’re telling everyone that Doteasy is the web host of your domain name and handles any requests pertaining to your domain name. The request is then sent to Doteasy, where our name server looks up your DNS zone file for your MX record and sends the email message to that mail server that handles all of your domain emails.